Mozilla will release new versions of the Firefox web browser for all supported channels later today. This brings the stable version of the browser to version 37 while Beta, Aurora and Nightly versions are upgraded to 38, 39 and 40 respectively. Firefox's Extended Support Release will be upgraded as well to version 31.6. To find out which channel you are using type about:support in the web browser's address bar and check the version under application basics near the top of the page that opens up. The guide below provides you with information about changes that went into Firefox 37. Firefox 37 is already available on Mozilla's public FTP server. It is usually not a good idea to download it from there directly as last minute changes may make a different build the release build. While this does not happen often, it did happen in the past. Probably the best way to upgrade is to run a manual update check in the browser. You do that by tapping on the Alt-key on your keyboard and selecting Help > About Firefox from the menu bar at the top that is displayed when you do that. Mozilla hosts all downloads and you can download them from the site as well to upgrade or install anew. Use the following links to do so (note: the recent updates may not be available yet). Firefox 37 does not introduce many new features in the browser that are visible to users. When you visit YouTube's HTML5 video player page you will notice that Firefox 37 supports Media Source Extension now on the site. While you could force support previously by changing browser preferences on the about:config page of the browser, that is no longer necessary at least not for Media Source Extensions and MSE & H.264 which are both enabled by default now on the site. Confirm you will be careful if the warning appears. Double-click on it to toggle its value (to true). Reload YouTube's HMTL5 check page and you should see that the last option is supported as well now on the site. This feature is limited to YouTube by default. To change that modify the preference media.mediasource.youtubeonly and set its value to false using the method listed above. You may run into issues on some sites if you enable that feature globally though. If you do, repeat the process to disable it again. Heartbeat adds a User Voice like system to Firefox allowing Mozilla to get user feedback directly from users of the browser. I covered Heartbeat when it first appeared back in February and suggest you read the article that I wrote back then for additional information about it. Open the about:config page again as outlined above. Double-click the parameter and set its value to blank. To undo the change, right-click on the preference and select reset from the context menu. Security improvements are usually not something that are visible to users. The following paragraph lists the improvements that went into Firefox 37. Bing Search uses HTTPS by default now. TLS False Start optimization requires a cipher suite using AEAD construction. Extended SSL error reporting to report non-certificate errors. Added support for e-mail name constraints in certificates. Opportunistically encrypt HTTP traffic if the server supports it. The security panel lists security-related information about the selected entry in the network panel. This includes connection details such as the protocol version and cipher suite used but also certificate information and security features used by the connection. If the selected element on a page is animated, Firefox displays the Animations panel which displays information about it and provides you with play and pause buttons to control it. Debugger panel supports about:// and chrome:// URIs. Logging of weak ciphers in web console. The majority of changes of the desktop version of Firefox were also implemented in the Android version. I suggest you check out the changelog if you are interested in those. Below is a selection of features unique to Firefox for Android. 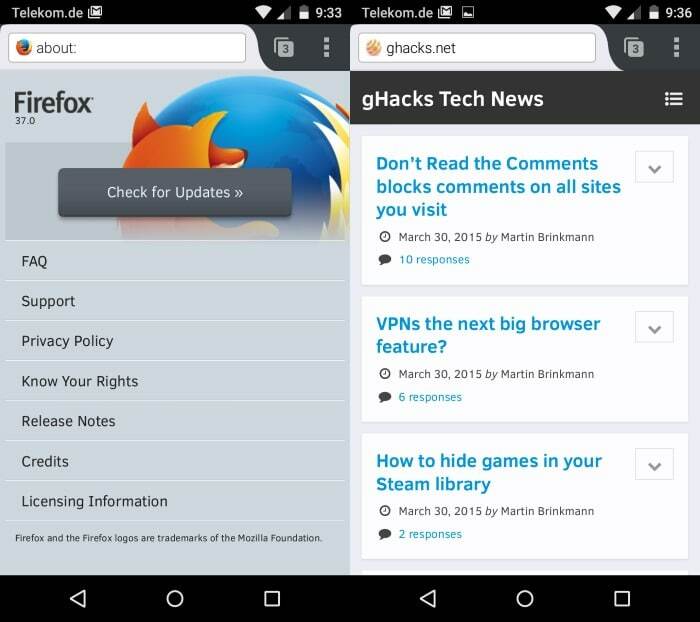 Tablet interface updates launched in Firefox 37 for Android. You will probably notice right away that tabs are on top now in the new interface. Other changes include a redesigned tabs tray displaying all open tabs in the browser. You find additional information about the new interface on Medium. Support for sending videos to Matchstick devices. URL bar displays the url instead of the page title by default now. Security updates are released a short while after the Firefox 37 release. I'll add those once they become available publicly. A detailed look at Firefox 37 listing all the changes and new features that went into the new release of the popular web browser. And as for telemetry, they should ALWAYS ask users. what about 64-bit version, any news, cause it’s in beta? Does not seem to be available as a stable version yet. v37 Final has not x64 and even its beta x64 was not official. 38 Final will release it. really not official beta? then how come it’s was in Mozilla’s ftp from 37 beta 2? x64 is available as nightly and works fine for months now. You might want to disable Electrolysis in the options, because some addons might not work with it. Everything else (addons/plugins(flash)) work just fine. My only beef with Nightly is sometimes it can’t update (stuck in a loop forever repeating – restart now to update), or other times there are multiple updates in a single day/hour. But other than that, all my add-ons seem to work fine. The bonus over the 32b version. It loads A LOT faster now! They removed full installer file links. On this page https://www.mozilla.org/en-US/firefox/all/ all links are to stub installers. Came here to comment on that. What a silly move. It’s as if they were trying to upset people on purpose. If someone more than 2 computers and a network storage this only serves to annoy such user. They have changed it since the time we commented on that. When the “whatsnew” page is nothing more than “For flip sake, we’ve got zero market share on Android, would you PLEASE install Firefox on your phone!!! ?” we’re in trouble. You’ve done very well Martin to find anything to report about in terms of changes, let alone new ‘features’! Not in my case. I test searched from Searchbox and it is not HTTPS. That’s strange, it is listed as a feature and working when I try it in the recent version. Did you add Bing Search manually by chance? Could be. But when I go to Bing directly and try to search, there is no HTTPS either. Google and Yahoo are HTTPS. I had loop.enabled set to false in about:config and Firefox 37 changed it back to true. I do not want or need this feature and do not appreciate Mozilla changing my settings without notice. They have removed they way to disable social api too. What do they have to gain by adding bloat? I don’t remember when I have changed it to false but I updated today and it is still set to false. Perhaps it had something to do with Classic Theme Restorer then. Who knows. On the positive side YouTube is working much better with 37. Very good for stupid sites that keep reverting to non-secure content, allows you to force them to always use the secure version. Or use https everywhere add-on. Since the beta version of Firefox for Android v37, the ftp downloads of android-arm is split into two: api-9 and api-11. How to know which one is suitable for which android versions/handsets? I suppose Mozilla is referring to the minimum Android SDK. Api 9 would require a device running Android 2.3 or newer while Api 11 Android 3.0 or newer. This is just my guess though but it would make sense. So, according to your guess, which api is best-suited for devices running android v4.0.x, 4.x.x, 5.x? I’m asking this mainly bcoz, if both api supports the above android versions, then it’ll lead to more confusion among downloaders from ftp servers or third-party sites. Also, it may lead to many fake apk spreading with malware. Is there any documentation regarding the api differentiation in mozilla / wiki support pages/sites? I’d pick the newer which is the better choice most of the time. So, are u referring to api-11? You mean if I recommend it? Since I have not tried either, I cannot do that. I would try Api 11 though. My friend tried the api-11 apk with android 4.0.x since Android v4.0.3-v4.0.4 is API 15. It was successful. For android v3.0 and “above” can install Firefox api-11 apk. You can still get the full download at other sites, Major Geeks for one. I too think that Mozilla is trying everyone’s patience. Don’t need to d/w from 3rd party sites. There is an easier method for direct download. What I did is just removed “-stub” from the link and typed the “version number” with “-SSL” and then press “Enter”. I think this change is mainly bcoz they might release x64 versions and the stub can install the s/w according to the system architecture. I’d suggest them to split the links in “all” page similar to linux downloads. Thank you for the Download link. Better than a 3rd party download! Martin, in previous versions, you told us how to remove from the pluggins “OpenH264 Video Codes…. With this 37.0 version, I again have this plugin. You reference no longer works for me. Could you show us how to remove this plugin? I have it set to Never Activate, but would to remove it. They’ve fixed the download link. Now you can just click on the link next to preferred language and download from “all” page. THANK YOU Martin! With your help, I have removed this plugin. …yea, maybe it’s time to re-evaluate these FF settings I have used (for speed and security), and updated, for years. Are they all still valid? Have I missed any? …and now “heartbeat…” (NOTE: “*”=multiple related entries to confirm). Also, THANK YOU for your years of valid and useful data! Those look decent as far as I know. I would add beacon.enabled = f, network.dns.disablePrefetch = true and browser.pagethumbnails.capturing_disabled = true. browser.history.allowPopState, browser.history.allowPushState, and browser.history.allowReplaceState could be set to false, too. Thanks – missed “datareporting”, and also “browser.pagethumbnails.capturing_disabled = true” is not found. Do you know of any other FF sites for Linux that harden it and make it secure (as is possible)? @Martin – Did I just miss it or did you not include the new “Opportunistic Encryption” feature of version 37 in the article? Just wondering. Kirk thanks, yep I missed that. Heh, you’re welcome. It’s nice to know (in my old…er age) that I can still notice something that’s not there to be noticed…or something like that. So apparently FF37 was released a few days ago but when I check for updates 36..0.4 is the latets, what gives? Also disabling DSA whilst I agree is good for security I think they need to add a way to overide it given 1000s of sites still have DSA as their only method of access. 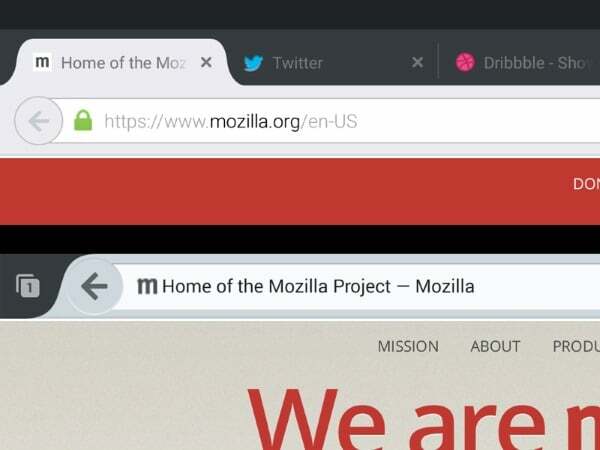 Mozilla pulled Fx37 because of a bug. Since updating to Fx 37.01 I have a problem with the size of videos not displaying the correct size: they are either too small or too big. I disabled Silverlight and Flash player plugins but videos still play on RAI site (the one I used for the screens) but it got sorted on Youtube so don’t know what to try next. Few days ago I also switched to an HD monitor but considering all those videos play fine on Chrome the problem must be on Firefox. Have you tried Firefox Safe Mode? Hold down Shift before you start the browser. Hi Martin, thanks for the suggestion. I actually tried with a brand new profile and the problem is not present so, I suppose, it must be some addon. If I find out the culprit I will post back to let others know. Ever since I updated my browser to version 37.0.1 from 36.0.4, I have been encountering a painting bug when switching tabs. After checking a bit and finding the proper bug report in their Bugzilla tracker (see https://bugzilla.mozilla.org/show_bug.cgi?id=1067470 for that), it seems like the problem has been getting worse ever since it was first reported in November of 2014 if the number of duplicates are anything to go by. It is such a pity that other browsers aren’t ready yet (or will probably never reach that point), because it looks like I’m going to have to live with this bug for months and that would usually be motivation enough to go out there and look for something better. Well, until a proper alternative to Opera 12 (mostly rebuilt in Firefox) exists, I’m stuck with this. A better way to disable this new piece of bells and whistles is to create “browser.selfsupport.enabled” and set it to FALSE. “Firefox Health Report” checkbox in “Options > Advanced” does not control “datareporting.healthreport.service.enabled”, but “datareporting.healthreport.uploadEnabled”. You can obliterate that one too.